Greece - IOM’s Displacement Tracking Matrix reports that a total of 990,671 migrants and refugees have entered Europe in 2015 from Africa and the Middle East by a combination of irregular land and sea routes. Analysts noted that land crossings into Greece and Bulgaria from Turkey now total fewer than 35,000 – or less than 3 per cent of the year’s total irregular arrivals. With about two weeks remaining on the calendar, it is virtually certain 2015’s total will surpass the one million mark, which would be nearly five times 2014’s total. IOM of course is very concerned about the high number of sea fatalities likely to accompany this continuing flow of migrants and refugees. Thus far in the month of December, 35 migrants – among them over a dozen minors – have drowned in the waters off Greece. Today’s count brings to over 700 the number of fatalities off Greece or Turkey this year. By comparison, IOM’s Missing Migrants project www.mmp.iom.int reported there had been a total of 264 deaths off Greece through October 16. So the 706 deaths reported in the Aegean through December 16 means there have been over 420 drownings in just over 60 days, an average of seven per day. We should add that 706 deaths of migrants and refugees crossing from Turkey to Greece are more fatalities than occurred in the entire Mediterranean in all of 2013, the year this emergency began to attract international attention. Despite ever colder temperatures and dangerous sea conditions daily arrivals to Greece’s Aegean islands continue to run in the thousands. A remarkably high number of migrant flows have been recorded on Greek islands. As the chart below shows demonstrates, on Tuesday (15/12) nearly 4,300 migrants and arrivals arrived, with over two thirds landing on Lesbos. 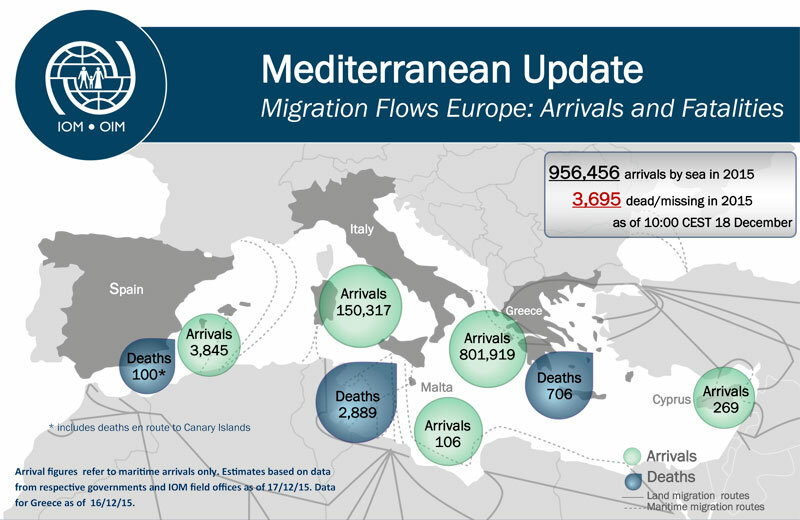 In 2015 just over 800,000 migrants and refugees arrived in Greece by sea through December 16. During December alone, some 57,000 migrants arrived and approximately 45,000 (80 per cent) left by crossing the border into the former Yugoslav Republic of Macedonia (FYROM). With many migrants now being turned back at the FYROM border, IOM Greece is expanding its outreach to growing numbers of migrants now stranded in Greek government reception centres in Athens. It offers them free assisted voluntary return to their countries of origin.